Founded in 1987 by all-girl rock band Show-ya, Naon no Yaon is a festival dedicated to female artists — although anyone expecting a kind of Japanese version of American chick-rock festival Lilith Fair will either be very disappointed or very pleased to learn that this event has a decidedly pop bent. Naon no Yaon is cosponsored by Japan’s increasingly monolithic Avex group of labels, which is taking the opportunity to push an interlocking web of high-energy J-pop cheer. Regular visitors to the ¥100 section of Book Off will perhaps recognize vocalist YU-KI from 1990s Tetsuya Komuro vehicle TRF. Futsal-playing Dream, fresh from their 2007 rebranding as DRM, will be making a valiant attempt to shake off their image as Morning Musume rip-offs, with appearances also planned for idol singers Nao Nagasawa, Nanase Hoshii and former Morning Musume reject Aiko Kayo. The main draw will probably be Naon no Yaon’s appeal to nostalgia, with the organizers’ most notable coup being successfully bringing together Kyoko Tomita and Atsuko Watanabe, the rhythm section of legendary 1980s pop/rock quintet Princess Princess, as well as Maiko and Miyu from the now disbanded bandoru (a combination of “band” and “idol”) group Zone. Jazz musicians Hiroko Kokubu and Kaori Kobayashi add a bit of variety and sophistication to the proceedings. 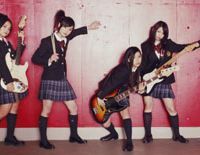 For anyone in search of tomorrow’s hot new thing, though, Osaka schoolgirl punk-popsters Scandal are the ones to watch. The buzz around them has been building steadily since they formed in 2006, thanks to a combination of catchy tunes and an extremely canny marketing strategy. That strategy has seen them playing regular free gigs in their hometown; turned them into an Archies-style animated series on the Web; has teased fans with limited-edition CD singles released every month since March; and seen the band touring the United States before even properly touring their own country. April 29 will be the chance for fans of fizzy, melodic, teenage guitar-worrying to see what all the fuss is about. Naon no Yaon takes place at Hibiya Yagai Ongakudo, Tokyo on April 29 (a national holiday) from 3:15 p.m. Tickets are ¥5,800-¥7,800; for more information visit www.naonnoyaon.jp or call (0570) 00-3337.